Chicago’s unique contribution to the elegance and passion of Spain’s dance, music and culture is showcased as never before in Ensemble Español's 37th American Spanish Dance & Music Festival, Wednesday, June 12 through Sunday, June 23. In addition to Dance For Life, this year the Festival partners with two other organizations, expanding the Festival’s reach: the north side’s Old Town School of Folk Music, and Instituto Cervantes in downtown Chicago which will host a reception and pre-release preview presentation of the "Sobre las Olas" documentary film on Flamenco in the US. featuring Dame Libby and the Ensemble Español (June 13). Northeastern Illinois University will once again be the site of the popular series of Spanish/Flamenco /classical/folkloric master classes (June 14-20) and the North Shore Center for the Performing Arts in Skokie will host the Flamenco Passion Gala Performances (June 21-23). "Sobre las Olas - A story of Flamenco in the US,” directed by Carolina Loyola-Garcia, will have a pre-release exclusive preview event at Chicago’s Instituto Cervantes Auditorium, 31 W Ohio St., Thursday, June 13 at 6 p.m. Since the early 20th century, the art of Flamenco has been crossing the ocean traveling to faraway places, including the United States. The legendary José Greco spread this art form throughout the Americas making it a household word. Many have fallen in love with its deep songs, cries, rhythms and movements. This documentary brings us into the heart of Flamenco in the US and to the artists who keep it alive.Featured artists include Carmela Greco, daughter of the legendary José Greco, and Dame Libby Komaiko, Irma Suárez Ruiz and Jorge Pérez of Ensemble Español Spanish Dance Theater. Other featured artists include Edwin Aparicio, Ricardo Marlow, Jesus Montoya, Barbara Martinez, Rebeca Tomas, Elba Hevia Y Vaca, Marija Temo, Manolo Leiva, Maria Benitez, and Cihtli Ocampo, among others. Following the screening there will be a Q & A with Carmela Greco, Dame Libby Komaiko and dancers of the Ensemble Español and a Spanish Tapas & Wine reception by Emilios Tapas Restaurant. Tickets are $15 (general admission), $12 (students and seniors) and $10 (IC and ILCC Members). The documentary film "Sobre las Olas- A story of Flamenco in the U.S.,” is funded by Heinz Endowments, Pittsburgh Foundation, the National Endowment for the Arts and private donors. Northeastern Illinois University Dance Studios, located at 5500 N. St. Louis Ave., is home to seven days of Spanish master dance classes and workshops in the classical, folkloric and Flamenco styles taught by stellar guest artists from Spain, June 14-20. The comprehensive series includes classes and workshops in Neoclassical, Clásico Español, Regional/folkloric and Flamenco styles. Students will have the opportunity to learn from an impressive roster of international guest artists, including the world famous Carmela Greco; Paloma Gómez, Artistic Director of Compañia de Danza Paloma Gomez ; José Barios, Principal dancer with the Maria Pages Company of Seville, Spain. Tickets are $26-$46; free parking is available. For tickets, call 847-673-6300 or visit northshorecenter.org. Mini-group rates ($22-$39) are available for groups of 6 or more. Call 773-327-3778. Featuring world, U.S. and Festival premieres and highlighting the 20th anniversary of Dame Libby Komaiko's International Flamenco masterwork ballet,"Bolero"
“Festival time is always exciting for us. We are thrilled to be adding the Old Town School of Folk Music as partners and the pre release preview of the documentary film “Sobre las Olas” at the Instituto Cervantes. I am also thrilled to mark the 20th anniversary of “Bolero” given the overwhelming international reception throughout its history. Sitting in the audience for the 2010 Dance for Life benefit gala concert at the Harris Theater in Millennium park, my heart was passionately pumping as the dancers began and my soul took flight when the entire audience jumped to their feet in uproarious applause as the company devoured the full stage, rushing and twirling, with their Spanish fans and toreador capes. ¡Ole! We are honored to donate part of the proceeds from our Friday, June 21 opening gala performance to benefit Dance for Life. We are also extremely grateful to once again have the support of our in resident partner, Northeastern Illinois University, the North Shore Center for the Performing Arts in Skokie, plus an incredible roster of guest artists and sponsors, who have generously contributed to the success of our festival”. Dame Libby Komaiko, Founder and Artistic Director of Ensemble Español. A Flamenco contemporary drama depicting the passions of everlasting love. Music: “Semblanzas de un Rio” by David Peña Dorantes. This grand work has become a traditional dance presentation performed by the great masters of Spanish dance which include Paloma and Raquel’s parents, Raquel Rodriguez and Jose Gomez. The choreographer and dancers dedicate this premiere special tribute to their parents. Music: “La Torre del Oro” by Geronimo Gimenez. Music by Antonio Gabarri Jimenez, Flamenco guitarist, Paco Fonta, Flamenco singer and guitarist, David Chiriboga, Flamenco guitarist and Javier Saume-Mazzei, percussionist. 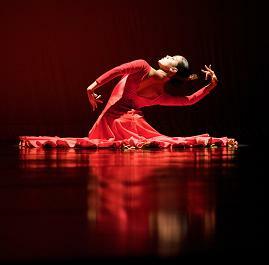 This Flamenco drama premiered at the Carmen Hall Theater in Ugata, Japan in March 2013. Music by Isaac Munoz and Susana Ruiz. Dancers: Ensemble Español’s Crystal Ruiz, Julia Hinojosa, Olivia Serrano. Joining Ensemble Espanol for these performances will be guest dancers and choreographers including Carmela Greco (Madrid), daughter of the legendary José Greco; Paloma Gómez & Raquel Gomez (Madrid), former principals with the National Ballet of Spain; and José Barrios (Cordoba), principal dancer of the Maria Pages Company. The impressive roster of guest singers and musicians will include Flamenco guitarist, Antonio Gabarri Jiménez (Madrid), Flamenco singer and guitarist, Paco Fonta (Miami), Flamenco guitarist, David Chiriboga (Ecuador), Peruvian Tenor, Luis Galvez and Venezuelan-born percussionist, Javier Saume Mazzei. Under the artistic direction of founder Dame Libby Komaiko and associate artistic director, Irma Suárez Ruiz, Ensemble Español is internationally recognized as the premier center for Spanish dance, music, art, culture and education in residence at a state university in America, Northeastern Illinois University, Chicago. It’s 40 sensational dancers, singers, instrumentalists with international guest artists promotes and preserves , Spanish dance culture in all its forms from classical, folkloric, Flamenco and contemporary dance and music traditions of Spain from the renaissance through the XXI century . In 1982, Dame Libby became the first American artist in history to be decorated with Spain's highest honor "Lazo de Dama" (Ribbon of the Dame) de la Orden de Isabel La Católica by his Majesty Don Juan Carlos I, King of Spain for her artistic, cultural and educational work throughout the U.S. Ensemble Español has been in residence at Northeastern Illinois University since 1976. For more information visit EnsembleEspanol.org. Through poignant personal testimonials, passionate music and powerful dancers bodies in motion, Dance for Life: The Documentary painted a rare, you-are-there portrait of the generosity and compassion of Chicago's dance community over 20 years (Joffrey Ballet, Hubbard Street Dance Chicago, Giordano Dance Chicago, River North Dance Chicago, Thodos Dance Chicago, Chicago Human Rhythm Project and Ensemble Español). The film featured the dance companies that participated in the 2010 Dance for Life benefit performance which opened with Dame Libby and the Ensemble Español’s passionate “Bolero.” The documentary won Emmy Awards for Outstanding Arts/Entertainment Special (Scott Silberstein, Producer, HMS Media)) and Outstanding Director (Matt Hoffman, HMS Media). · “The History of Bolero"
The 37th American Spanish Dance & Music Festival is made possible in part with support from Northeastern Illinois University; The Chicago Community Trust; the Illinois Arts Council, an agency of the State of Illinois; Fifth Third Bank; Southwest Airlines; Consulado General de España; City Arts Grants-Chicago Department of Cultural Affairs; the International Latino Cultural Center of Chicago; Enterprise; Holiday Inn-Chicago North Shore; Emilios Tapas Restaurant; Athletico; Chicago Dance Supply; HMS Media; The North Shore Center for the Performing Arts in Skokie, José Greco Foundation and individual donors . Univision Chicago; LaRaza; arteyvidachicago.com and Spanish Public Radio—WDCB 90.9. Additional support is provided by Instituto Cervantes, the Old Town School of Folk Music, Studio Mangiameli , Chicago Dance & Supply, Athletico Physical Therapy and the Flamenco Arts Center.